Vandals have caused thousands of pounds worth of damage to Chester’s historic Grosvenor Park. 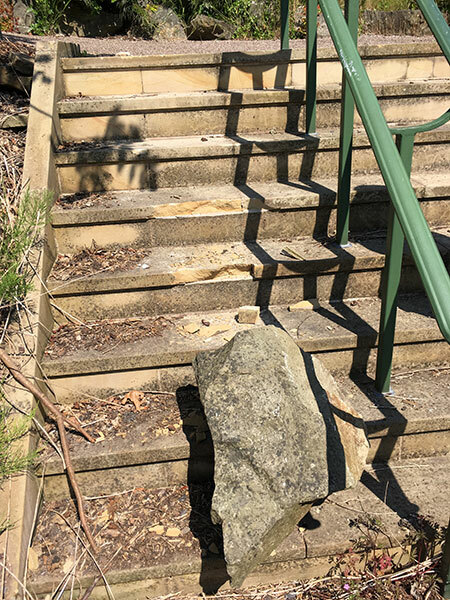 Last month a large rockery stone was used to smash the sandstone steps leading down to Grosvenor Park Terrace. As a result one of the entrances has been closed off for safety reasons. Repairs to the steps will cost in the region £3,400 and will take around two months. Due to being a heritage park, a comprehensive survey will be required before the repairs can take place and a specialist contractor will be needed to carefully dismantle and then replace the steps. The 20 acres (8.1ha) Park, which overlooks the River Dee, is regarded as one of the finest and most complete examples of Victorian parks in the North West of England, if not nationally. On 22 August 2013 the designation of the park was raised from Grade II in the National Register of Historic Parks and Gardens to Grade II*. The Council’s Cabinet Member for Environment, Councillor Karen Shore said: “This senseless vandalism has spoiled everyone’s enjoyment of the park and damaged wonderful, historic structures. “PCSOs and our Community Safety Wardens have been made aware and will be increasing patrols in the area to clamp down on incidents like this. “The costs for repairs could have been better used to provide materials for our wonderful volunteer groups, who help us maintain this beautiful and historic park. The land where the Park is situated formerly consisted of fields, was given to the city by Richard Grosvenor, 2nd Marquess of Westminster. The Marquess also paid for the design of the park by Edward Kemp. It was laid out in 1865 to 1866 and opened with great celebration in November 1867.